Riding with the Inter-School Horse Show Series (ISHS) means partnering with a community of schools, students, mentors, and motivators who support your riders. The hundreds of riders who have come through our series have had the opportunity to be on a team, represent their school in the ring, build relationships with other students who share their passion for horses. Because you do not need to own your own horse to compete, our shows have made competing accessible, affordable, and simple for equestrians, parents, and schools. We are proud to say that over 500 young riders have had the opportunity to participate in school-organized team sports because of ISHS, and we can’t wait to welcome yours (and you!) to our family. On this page, you'll find basic ISHS information to help your school get started. Click here for more details about how our shows work, click here to contact us with questions, and click here to sign up. Click here to hear what people are saying about ISHS. Our shows competitive-- but low stress and fun! We have classes for everyone from first time showers to A Circuit riders, and we always welcome new schools and students to sign up. Riders can bring their own horse or ride one of ours, and classes are judged on Equitation (meaning the judge looks at the rider and ignores the horse) so it's fair for everyone. We welcome equestrians to ride on a school team or as an Independant Rider (which is our way of saying they ride solo-- like at a standard horse show), and can compete in as many (or as few) shows as they'd like. But points are accumulated throughout the year, so the more shows they enter the better chance they have at winning a year end award! ISHS is a competitive community that both challenges and supports your students. We emphasize good sportsmanship, teamwork, and we strive to create a positive, encouraging environment that celebrates the hard work, dedication, and athleticism of our riders. Coaches help your kids, so you get to sit back and relax! Our shows are a totally unique equine experience for both students and parents. For your child, we are a competitive community that makes it possible for them to compete on a team, connect with their classmates, and represent their school in their sport. For you, our shows are basically like going to a soccer game. The coaches help the kids throughout the day, so you get to sit back and enjoy the show. BYO-H or borrow one of ours. Click the pic to watch the vid. Unlike traditional horse shows, competitors do not need to have their own horse (or tack) in order to ride in ISHS. Riders are allowed to compete on their own horses, and riders who do not have their own horses can "lease" one from the host barn at each show. About half of our riders leave their horses at home, and at our shows judging is based on the rider-- not on the horse-- so every rider is competing on the same playing field. Click here for more information on leasing a horse. We value sportsmanship and recognize exceptional team players with plaques that are larger than their horse's heads. We believe that being a great athlete means being a good sport, so in our series we recognize both athletic ability and good sportsmanship. We pin each class individually, and award Champion and Reserve Champion for each Division (just like at a standard horse show). But in our series, we also reward the top two teams of the overall show. Throughout the year, we also keep track of both individual points and team points. Then, at the end of each series, top riders are welcomed to our Invitational Show, and top teams are showered with Year End Awards. The Sportsmanship Award is crowd sourced, and nominations are open to everyone all year long. At the end of the year, we award one JV rider and one Varsity rider with a pat on the back (just kidding, winners get very big plaques). Click here to for more info about scoring, and click here to learn more about our Sportsmanship Awards. We have classes for all experience levels, and we welcome riders of all disciples to compete. Our Varsity Advanced division is perfect for A Circuit competitors, and rookie riders love our JV Maiden Division. That division is perfect for first time horse showers-- the flat classes are walk/ trot and walk/ trot/ canter, and we let instructors in the ring to help riders over fences. Click here to see our Prize List and to watch sample over fences classes. We asked a first year horse shower what it's like to ride in our Maiden Over Fences class. Here's what she said. See a sample of our Varsity Intermediate division. Click the pic to watch the vid, then send it to your Athletic Director to answer all their questions. The first step to starting a team is to talk to your child's Athletic Director. We have found that most schools are excited to offer horseback riding as either a club or a varsity sport, so talk to your Athletic Director to determine how riding can be integrated into your school's athletic program. Teams can be made up of any number of riders (even 1! ), and we do not need proof of school support. Click here for more info on teams. We made a video to quickly answer all of your Athletic Director's questions. Check it out and then send it to them! Riding isn't a traditional school (or team) sport, but we make it possible for your child to ride on a team and represent their school in the ring. Our shows are organized similarly to traditional Hunter shows, with a few adjustments to accommodate for teams. General info is below and click here to see more details. Riders need to be in grade 5-12. *Independant Rider is our way of saying you ride solo (like at a standard horse show). Click here for more info about eligibility. Click here for more info about starting a team. Click here for more info about Independant Riders. One Sunday a month during the school year. Register one show at a time. Start any time during the season. Participate in as many (or as few) as you want to. Click here for show dates and click here for locations. Click here for details about how our shows work. Riders have to be taking riding lessons, but schools don't need to organize them. So as long as your child is taking regular riding lessons, they're good to go. Click here for more info about lessons. Teams can be made up of any number of riders. Even one rider can make up a team. Everyone on the team must attend the same school. We allow both clubs and teams to compete. We do not need proof of school support. Click here for more info about starting a school team. Rider need to have a coach on site a the shows, but your school doesn't necessarily need to provide one. 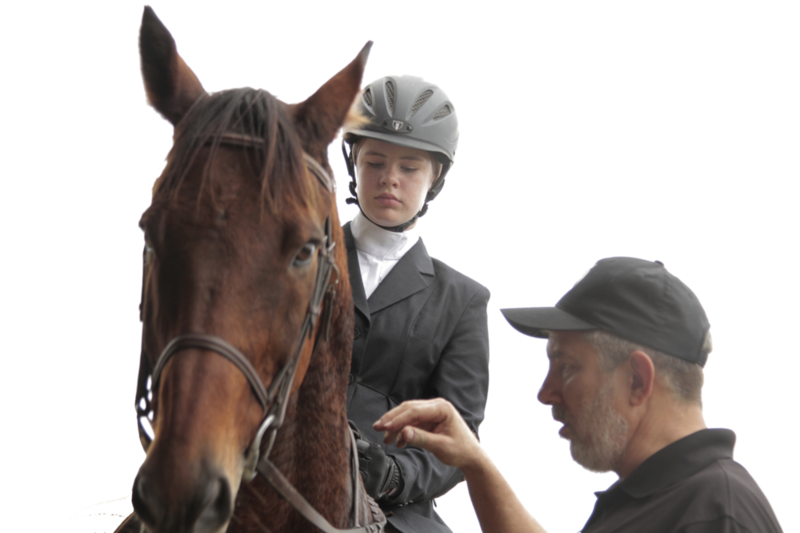 A coach just has to be a horse-knowing adult (parent, teacher, instructor...) who can help the rider during the show. Need a coach? We've got you covered. We have ISHS coaches on site at every show, so if your child/ team needs a coach, just check the box on your entry form and we'll hook them up with one of ours. Click here for more info about coaches. Click here to sign up and make sure to check out our Rules page-- it has all the details on how we work. Join our Facebook group to stay up-to-date on important announcements, such as weather delays. Click here to join.